Merry Christmas to all of you! I hope your day is filled with laughter and good times with your loved ones. Thank you all for your readership and support, this site would not be the same without you and your visits. Buches De Noel – Looks Like Christmas Is Finally Here! Buches de Noel also known as Yule Logs were the challenge given by Lisa and Ivonne, founders and co-host this month of the Daring Bakers. I think they just had the perverted idea to see us buttered, creamed and rolled in light genoise, Swiss buttercream, decorated in meringue and flavorful Marzipan. You should not that when I talk in those terms it can only be because they gave us an awesome challenge! Did I mentioned I buttercreamed my hair? Hmm, yeah…what I thought was the first gray hair was just a streak of buttercream from picking up the phone, lifting my glasses up and frosting my hair with a fork full of buttercream. See, they even raise my blood pressure…those two I tell you!! Buche de Noel is ancient tradition in my family, and I think for most European families as well. Wasn’t too long after I figured out how to make genoise that yes, it could be filld, and yes it could be rolled and “oh my!” before you know it I was making it for our Christmas dinner. Over the years, there were the traditional stump looking one, with flavors just as traditional: chestnuts, chocolate, caramel, coffee. One year I decided to make a pink and purple one to match the table setting (not Grandma’s favorite!). We also had the genius frozen one that required 6 hands and an electric knife for proper dissection! Yeah, not an event I wish to revisit. Buche de Noel, how do I love thee….well ask me next Tuesday when I am done making them for family, church, friends and strangers. Ok, so they pay me, still…I like when Yule Log season starts, I also like when it ends. This time our instructions were to do a light genoise, fill and frost it with preferably coffee Swiss buttercream, so as to prevent any white/red/green/blue logs (how did they find out about my childhood one is still a mystery J) although options were given for those who did not like coffee. Requirements for decorations were either meringue or marzipan mushrooms. It turned I needed two logs within days of each other so instead of visiting the recipe twice, I went ahead and made double batches of everything. I have long ago learned that December is the most hectic month of the year in which days are 12 hour long instead of 24…yep, really and although I am a night owl I have also seen too many sunrises this month with buttercream in my eyes? Did I mention I tried it as eye shadow one night I still had someone the back of my hand and went to rub my eyes? - burnt orange genoise: instead of mixing orange zest in the batter, I scattered it on top and put the tray in a hot oven. The zest got darker but nor bitter. - Decorations: Meringue mushrooms called for in the recipe and then I needed to challenge my sculpting skills so I made a marzipan teddy bear (Theodore), a red hatted snowman (Albert) and green hatted snowman (Truman). Lisa challenge me to a moose which turned out looking like a donkey so I ate it…I am evil, I know! That’s where I challenged myself and the log almost won: I had the crazy idea that it would be cool to have a layer of vanilla bean crème brulee inside the Yule Log. How was I going to come up with that? I made a classic brulee batter, threw in some gelatin, poured it into a sheet pan and let it set in the fridge. Rolling that thing in the cake proved to be a challenge as the set batter had only one thing in mind, escape!! But I stepped away, took a deep breath and rolled again, tighter this time,and closed the thing shut. - decorations: I drew rounds on top of the log with a glass and carefully spooned out some of the cream, filled the indentation was homemade chocolate sauce. That way the log comes with its own sauce and everybody get a little extra chocolate! The final testing for that one will be Tuesday, for now it is parked in the freezer, well wrapped, hoping I don’t crush it with a bag of cauliflower! Did I mention I also buttercreamed my dog? My spatula was overloaded, he yapped, I turned abruptly and a big dollop landed on his snout. He spent ten minutes chasing it around, on its own nose…a sight to be seen! The cake was light and airy and the buttercream smooth and oh so good sandwiched in between chocolate shortbread cookies! I had a blast, as you can see by the pictures and should you want the recipe, check either Lisa or Ivonne for the full lowdown. I am having issues with blogger so not posting the recipe just yet. Make yourself a good cup of coffee and check out all the beautiful logs out there. I often talk about my neighbor C. and her twin boys and how they are a loving, loud and buoyant pair. What I failed to mention so far is that about once a week, I "borrow" her boys for the afternoon. This expression started over a year ago when I kept the kids occupied one afternoon by teaching them how to make cookie dough while she was cleaning the house top to bottom and had no way of keeping them busy without supervision. They play a lot on their own but believe me we are still amazed at how they made it to seven so far without a broken leg or worse injury: fire, water, engine, anything that rolls, chops, cuts, explodes will find a way into their hands. Having said this you might think I was crazy for volunteering to have them over. Well, when things start getting heated and borderline out of hand, I give them"the look". My grandfather Rene had "the look", piercing and serious enough to make you melt in your socks and I am glad I inherited that particular feature. One glance and the boys were playing somewhat in a quieter way but not entirely to make a studious afternoon: what fun would it be to make cookie dough without a little play, right? I was merely trying to keep the dough on the counter and not used as putty on the walls and grout on the kitchen floor. After that afternoon last year, their dad joked around and asked if I still wanted children after that experience and I joked "I'll just borrow yours for the time being", and that's how the expression stuck around. Last Friday C. asked me to watch over the boys so she could pack the family's suitcases for their trip to North Carolina. I said "Great! Let's do A Drop In and Decorate Party! "...which was received with 6 incredulous eyes and a big "a what party?" I then proceeded to tell C. and the boys how crucial they were going to be in bringing some joys to less fortunate kids their age. Every year since 2002, Lydia of The Perfect Pantry hosts a Drop In and Decorate Cookies For Donation. When I read about it in November I mentioned it to a few friends but we never seemed to be able to find a suitable baking day. Thus, when I was supposed to borrow the twins last week, it seemed like my last chance to bake for a great cause before the full blown crazy wind of the holidays. Let's just say that I spend half my day saying "Don't touch that with your red hands! Step away from the wall! The first one to open the oven without me has to spell brother backwards, etc...." Interestingly enough, I never have to say these but a couple of times as they are completely into their task and they took their job of decorating for charity very seriously. They had a purpose, they were going to play Santa, they were going to make people smile. I love hanging out with those two because you give them the choice between a video game and piece of wood to go bang on something...they'll go bang and march down the street to get the other kids involved. But again, that might just be because C. is the coolest mom ever!! In a large bowl, mix the flour,baking powder and baking soda and set aside. In the bowl of an electric mixer fitted with the paddle attachment, whip together the utter and sugar until light and airy. Add the egg and whisk until well incorporated. Add the flour mix and whisk until incorporated. Divide the dough into two balls, flatten them out and wrap them in plastic film. Refrigerate for a couple of hours or overnight, until firm. Remove one dough ball from the fridge and roll the it out in between sheets of plastic wrap or parchment paper. Use your favorite cookie cutters to cut out as man shapes as desired. Reroll the scraps, and refrigerate that smaller dough until firm again. Work with the other dough ball in the meantime. Bake the cookies until they just about turn gold around the edge,8-10 minutes at 350F. Let cool completely before icing. Using electric mixer, beat the powdered sugar and egg whites until thick and shiny, adding more powdered sugar by tablespoonfuls if mixture is too thin to spread, about 3 minutes. Add lemon juice. Add more powdered sugar if the icing is too thin for your taste. Divide icing into portions. Add different food coloring to each,according to what you plan to decorate. Cover until ready to use. You can refrigerate the icing for a couple of days if necessary. Meeta's Monthly Mingle this time around is centered around the event created by Lydia, so the cookies in the above picture are also virtually going to Germany! I am sure your holiday baking is full of cookies and cakes and after spending a lot of time in the kitchen, the last thing you think about is more desserts. Well, what if I were to bring you these two-bite coconut creme brulees and coconut sorbet? Do I see a sparkle in your eyes again? Granted you have to like coconut to begin with but knowing you can keep the cremes plain or flavored to your taste is always a good thing. Since the weather had been so nice and it felt more like a cool summer day than early December, I brought these along to our weekly get together with the neighbors. We were trying to get in full Christmas mode decorating C's trees (the party was at her house), drinking egg nogg while the kids were making sandmen instead of snowmen outside. Yet, no one was in the mood for fruitcake, pumpkin roll or chocolate cake. I had just finished a batch of macarons for gift giving and was facing an evil amount of egg yolks, so creme brulees were the obvious choice. My dear B. hates coconut with a vengeance, not the flavor but the texture, what he calls those gritty shreds, while I on the other hand love it...and love seems like a small word: the scent, the texture, the flavor...everything! I will always remember the day my dad brought a fresh coconut back to the house, piercing holes in it, the juice dripping down our chins, and cutting it open chopping its flesh out...nothing like what you find at the stores in pretty blue packages these days. The opening of the coconut was something of a ceremonial, much like the day he brought home papaya, scooped the seeds out,drizzled it with lime juice and handed a half to each of us...the best moment in a girl's life: eating with my hands, with juice and fruit all over and not a care in the world! Back to the creme brulees though. Since I had some coconut texture haters in the group,I decided to infuse the milk with the flesh ad pass it through a sieve prior to baking. The only shred of shreds (no pun intended) is the toasted coconut on top of the sorbet which you can omit if necessary. I used what C. had on hand, sweetened coconut so I reduced the sugar in the creme brulee batter and since it has caramelized sugar on top, I think you won't really miss it either. The sorbet is a simple syrup mixed with coconut milk and processed in a ice cream machine but you can achieve a nice sorbet by doing as follows: freeze the mixture for a couple of hours, take it out and whip it in your mixer with the paddle attachment or a hand held mixer. Repeat a couple of times. Preheat oven to 350F. Place 4 ramequins inside a roasting pan and set aside. In a large bowl, whisk the egg yolks with the sugar until pale yellow. Add the coconut. Heat the cream until scalding hot. Slowly whisk it into the egg yolk mixture, mix well,but ot too vigourously or you will add toomuch air. Pour into a container and let cool to room temperature,skim off the top foam if necessary. Pass the mixture through a sieve to remove the coconut and divide among the 4 ramequins. Pour water to about halfway up the sides of the ramequins and put the pan in the oven. Cook for about 15 minutes or until the mixture appear almost set,it should stillwiggleabit in the middle. It is ok to remove the pan from the oven at that point as the custard will continue to bake and set. Let cool to room, cover loosely with plastic wrap and refrigerate until ready to use. Right before serving: divide sugar on top of each custard and use a blow torch to caramelise the top or put the pan under the broiler. A good creme brulee is hot on top, room temp in the middle and cold at the bottom. In a saucepan, heat the water with the sugar until the sugar dissolves. Add to the coconut milk.Let cool to room temperature and process in an ice cream maker according to manufacturer's instructions, or use the hand held or mixer method described above. "99 Christmas Cookies in the jar, 99 Christmas Cookies in the jar. Take one down and pass it around, 98 Christmas Cookies in the jar. 98 Christmas Cookies in the jar, 98 Christmas Cookies in the jar. Take one down and pass it around, 97 Christmas Cookies in the jar. No Christmas Cookies in the jar. Crank the oven on and bake some more, 99 Christmas Cookies in the jar." And now you know how I get through an entire weekend of baking for us, the neighbors, the family, the friends, clients and patrons. Cookies, macarons, truffles, you name it. My fridge and freezer look like some kind of nut case replaced all food groups by just one, sugar. It leans towards that trend the other months of the year, but really I had a chuckle earlier when I reached for the veggies I needed to make ratatouille. I need to start making my holiday boxes and deliver/mail them soon or I am going to break down and start eating them all! I like to include a variety of down home treats like chocolate chip cookies, marshmallows, biscotti, and more delicate things like truffles, macarons, madeleines, etc... I like bringing my heritage into a bit of everyday style baking. 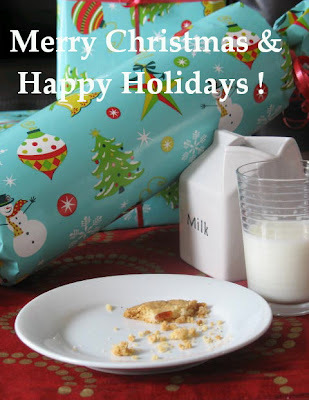 I know I am not the only one and I love all the family recipes popping around on blogs during the holidays. I am learning so much about holiday traditions from other countries and other people. It's like food traveling somewhere new everyday. Thanks to all of you out there sharing with me/us. And if you wish to find a list of tried and true Christmas Cookie recipes, visit Susan's Food Blogga blog where these Pistachio Cocoa Nibs ccokies are heading for her Christmas Cookies From Around The World Event. Now here is a recipe I tried recently that I think will become a regular in the Christmas cookie repertoire. I found it while reading one of my favorite blogs "Cake On The Brain". Her posts are funny, from the heart and always challenging her self and the way I think about things I deal with everyday. 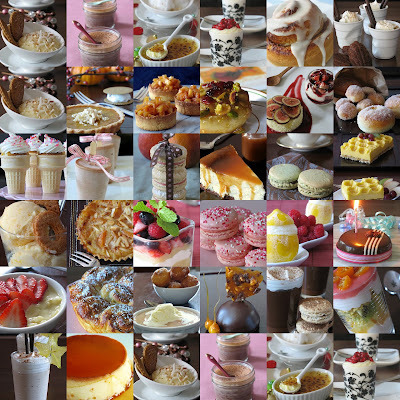 Sometimes I feel jaded by the world I bake for: catering, restaurant, private parties,etc... Her fresh and vibrant perspectives recharge my battery quite often. 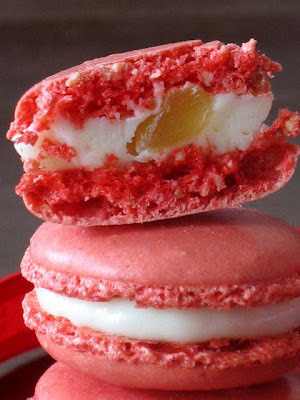 Go look at her latest macaron creation...with grated dried raspberry on top...how ingenious!! The original recipe is from Alice Medrich's Bittersweet calling for pecans, cocoa nibs and bourbon, which she adapted and which I adapted a little also by using pistachios and Cognac. The result, a delicate crumb, a punch from the cocoa nibs (thanks Lisa for the stash) and a little flavor from home with the Cognac. The first one is a shameless plug for a friend: Hannah from Bittersweet just published her first book, My Sweet Vegan. I am among the lucky few to have received a preview copy and I have to tell you to run and get it, regardless of your dietary preferences. I am not a vegan and yet I am wowed by the delicious recipes she wrote. I made her Lemon Lime Sunshine Bundt cake last night and could not stop nibbling on it all day long. Congratulations on your first book Hannah and I can't wait to see what is up next! The second one is to tell you about Menu for Hope. Although I realised too late the deadline to send in a participation item, I still urge you to go and donate. The amount raised will go to support the school lunch program in Lesotho, Africa. I already wish it were Friday... any Friday for that matter. The week is always better that day don't you think? Well, I am anticipating a very sweet one by virtually sending these to Zorra who is hosted Sugar High Friday for December, dedicated to puddings : "baked, steamed and boiled puddings or the creamy ones". I have to admit, I did not jump up and down when I read the theme since I will take tarts,cookies,cakes over puddings any day of the week. Although, come to think of it, I like panna cottas and creme brulees, which are also forms of puddings. Ah! Who am I kidding?! I had the chance to stir some sugar, eggs and cream together, and that is enough to make me happy! B. on other hand, as a good Southern boy, loves his custards and puddings, so he started bugging me early on last week: "Have you decided which one you will make?" - hugh...no. "What about my mom's banana pudding?" - hugh...no again. "What about steamed pudding like the ones I used to eat in England?" - hugh ...still no. Nothing against steamed pudding, which I like, but not my fancy at the present time since it is around 80 outside and close to 85-90 with the oven on. How far is Australia again? Because right now, it might as well be in my backyard!! So.....after searching for something refreshing and on the lighter side (if eaten with moderation) during this trying time of holiday parties and cookie making, I settled on two of my favorite tastes: white chocolate and pomegranate. 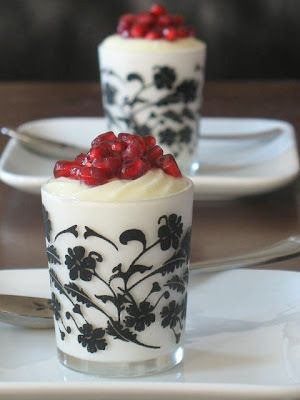 I loved this one: the creamy satin mouth feel of the white chocolate is really accentuated by the juicy and tart explosion of the pomegranate seeds in your mouth. (sounds good right?!) I made just enough for four, but I wish I had enough for 10 more...for me! I searched books and Internet sources for white chocolate pudding recipes but was never satisfied so I adapted the one I have come up with over the years for a vanilla based one. I will always remember the two lessons my grandmother taught me in the pastry kitchen: If you fail your creme anglaise, add cornstarch and make it a pudding. If you fail a cake, turn it into bread pudding.... I guess, puddings do make the world go round!! Heat 2 cups of milk, but do not boil. In a bowl, whisk the sugar and the egg yolks together until pale. In a separate dish, dissolve the cornstarch with the remaining 1/2 cup milk. Add to the egg yolks mixture and mix well. When the milk is hot,slowly pour it over the eggs,a little it at a time so the eggs don't start curdling on you. Return the whole thing over the stove and cook on medium low heat until it starts to thicken up. Add the white chocolate and stir until it is completely smooth. Strain if necessary. Pour the mixture into a clean bowl and let cool to room temperature, covered with plastic wrap punctured with small holes so the pudding does not form a skin while cooling. 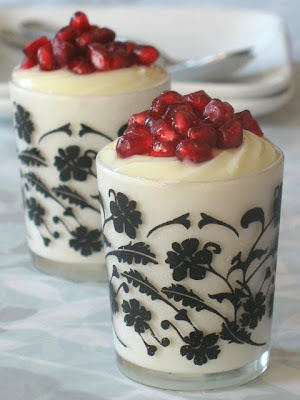 Pour into dishes and decorate with the pomegranate seeds or eat it straight from the bowl. Now....one more fun thing to do: announce the Pay It Forward winner. Congratulations to Sara from Ms. Adventures In Italy. So, a litte of France via South Carolina is going to find its way to Italy...pretty cool eh?!! You guys came in mass and I wish I could send you all a little something, I really do, but alas I am not married to Santa! There is a game going around the blogosphere these days called "Pay It Forward". 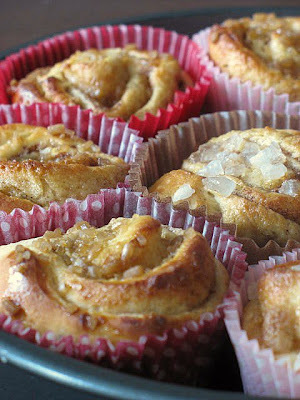 It looks like it started as craft exchange and slowly made its way into food blogs. Last month Graeme from Blood Sugar found himself the lucky recipient of a goodie package from Fanny and decided to pay it forward by having a little drawing of his own, and my name got picked...Yeahhh!!! On a side note, if you have never visited his blog, run to it people: amazing photography, delicious recipes and a wicked sense of humor! I received my package last Thursday and dare I say we already made a good dent in it! While exchanging emails with Graeme, I heavily hinted that I had a thing for Flake candy bars crossing my fingers that he would include one in the box. Lucky me, he put two: one praline and one dipped. There 's one missing in the picture, I know, talk to my stomach about that one! He also included a jar of onion confit that was delicious with roasted pork tenderloin last night. There was also a little square of tahini based "halva" . Seems like the lady in the shop where he was would not let him leave without it, and it turned out to be pretty good. B's favorite was the foam shrimp candy, it reminded him of the foam peanuts of his childhood, and I believe I only had a couple before the bag found its way into his desk drawer...hugh...! Last but not least, he included two very cute wooden cats, labelled as "ring holders' from his mother's favorite craft shop. What a sensitive guy! Thanks Graeme for everything. There is something really heartwarming about receiving a package whatever the content may be,unless it is a bag of coals from Santa! Now it is my turn to pay it forward. So here it is folks: all you have to do is leave a comment on this post and Monday night I will pick, at random, one person to be the lucky recipient of a box of handmade/homemade and favorite goodies from Tartelette's kitchen. Ah...Christmas...!! If I close my eyes real well and stand in front of the open freezer I can even almost pretend it is cold enough for Christmas. I don't think I'll ever get used to spending Christmas in a tee-shirt. Sorry if you are drowning under many inches of snow right now, but I envy you...Really, I do. It's not cold enough for soup, eggnog and stuffing and the small tree we put on the porch looks slightly out of place. Even crazier, when I decided to help some friends celebrate their tradition and stood in front of burning oil and fried sufganiyot for an hour. When I dropped by C' house with a plate full of them and a bottle of eggnog, it was finally starting to feel like the holiday season. I am not Jewish, but C. is and so are other friends around us and since they make sure to wish us a Merry Christmas, I wanted to make something in their honor during this year's celebration of Hanukkah. She often mentioned the jelly donuts her mother used to make during this holiday and since a sufganiyah is a donut is a beignet, well there was no way I was going to say no, eheheh!!! Hanukkah,the Festival of Lights, is a celebration of the victory of the Maccabees and the re dedication of the Jerusalem Temple. It also commemorates the miracle of the oil that burned for 8 days. Serving jelly doughnuts at Hanukkah, which are fried in oil symbolizes the miracle of the oil that lasted for eight days instead of one. There are numerous recipes for them online but I wanted to give dear Ole' Martha one last shot. It's no secret among the blogging community that we have issues with her recipes as written and we end up tweaking them to make them work. I settled on one of hers for the donuts and from a first glance at it, it seemed that the proportions of liquids to solids might work, so I played along. However, I had serious doubt things would work after mixing the dough as it seemed really really soft. But I trusted Martha and after the first rise, the dough was very supple and yet very easy to roll out and proceed with cutting out the sufganiyot. It was a pleasure to see C's and the kids' face when I dropped these off. I shared some eggnog and coffee with them while listening to family stories and traditions. I also enjoyed reading more about this holiday that although not completely foreign to me, had not been explained in details and researching recipes as well as history was a fantastic part of blogging. This is my entry to Meryl's Joyous Jumble, an event meant to discover other cultures' holidays during the month of December. Place flour in a large bowl. Make a well in the center; add eggs, yeast mixture, orange flower water, 1/4 cup sugar, butter, nutmeg, and salt. Using a wooden spoon, stir until a sticky dough forms. On a well-floured work surface, knead until dough is smooth, soft, and bounces back when poked with a finger, about 8 minutes (add more flour if necessary). Place in an oiled bowl; cover with plastic wrap. Set in a warm place to rise until doubled, 1 to 1 1/2 hours. "Hein! 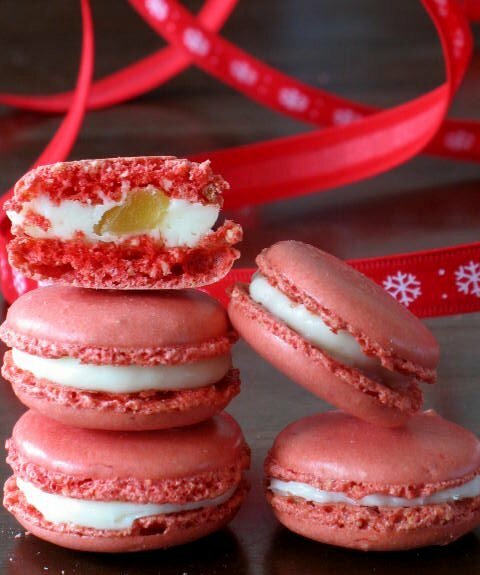 Des macarons aux cacahuetes..?! Ca va pas la tete Tartelette?! C'est pas des vrais comme Pierre!" "What? Peanut macarons? Did you lose your head Tartelette?! There are no the real thing like Pierre's!" Yes well, who said that macarons had to be 100% almond based? Not the pastry shops selling pistachio ones! Necessity is the mother of invention and that proved to be especially true last weekend when these little peanut macarons with a cream cheese buttercream and crystallized ginger center came out of my kitchen. I had just finished an order for deep red and deep green holiday inspired macarons with traditional fillings and almond shells when I found an extra bowl of buttercream in the fridge, and plenty of ripe egg whites. Since I was on the macaron making train, I decided to make one more batch for us and the neighbors. When I went to weigh the almonds, I had half of what I needed...darn...out of pistachios too and the walnuts were going in cookies...but eh! Peanuts were sitting quiet and pretty on the pantry shelf so why not?! What do I have to lose? Flat macarons, sticky macarons, cracked macarons? Not a problem! They could always find their destiny in ice cream! Really, what would be the big deal by replacing half the almonds with half peanuts? Peanuts are more oily than almonds but there would only be half the amount in the batter, not enough to make a big difference. I should be ok...and might as well pray too. A conversation with Veronica reinforced my belief things could get pretty tasty. I don't want to be stuck with eating macaron shells. Remember I am the one who loves making them but not that much eating them. Now is my time to fess up: I have already had six. That little surprise of ginger inside combined with the peanut taste and not too sweet filling is just sinful. In a food processor, run the nuts and powdered sugar until the nuts are finely ground. Run through a sieve if needed. Whip the egg whites until foamy, slowly add the granulated sugar, until they are glossy. Add the red food coloring. Slowly fold the nut/sugar mixture into the whites with a wide spatula. The mixture should remain shiny and flow easily. Fill a pastry bag with the batter and pipe small rounds onto parchment lined baking sheets. Let the macarons rest for 20 minutes. Preheat the oven to 315 and when they are ready, bake them for 12-15 minutes. Let cool, remove from the paper and fill with the buttercream, add a piece of ginger and top with another macaron shell. With a stand mixer and the paddle attachment, beat the cream cheese and butter until fluffy. Add the powdered sugar, give it one more whirl to incorporate everything. 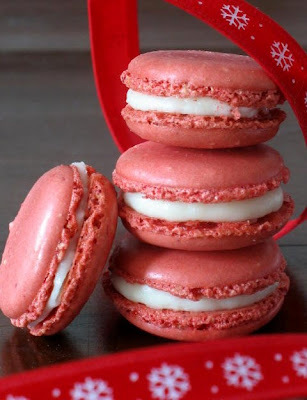 Fill a pastry bag with the mixture and fill the macaron shells.